Saudha, Society Of Poetry and Indian Music: 'one of the prominent Indian classical music promoters in the country' (BBC Radio), offers this two-day appearance in Fringe Festival with a hypnotic and 'breath-taking' presentation ('Rhapsody of Soul' -Guardian|| 'Seraphic ecstacy of Indian Raaga Music'- Yorkshire Reporter) of Indian classical music by the leading classical vocalist Chandra Chakraborty (ChandraChakraborty.info), and critically acclaimed, prominent accompanying artists like Baluji Shrivastav OBE (Sitar) Kamalbir Nandra (violin), Chiranjit Mukherjee (tabla) and Showmi Das (Kathak). This is seamlessly mingled with French, medieval, romantic troubadour music and haunting verses of world poetry in English by actor and Schubert vocalist Erik Schelander, to interpret and intensify the profound mood of the transcendental music. The event will be curated by T M Ahmed Kaysher. 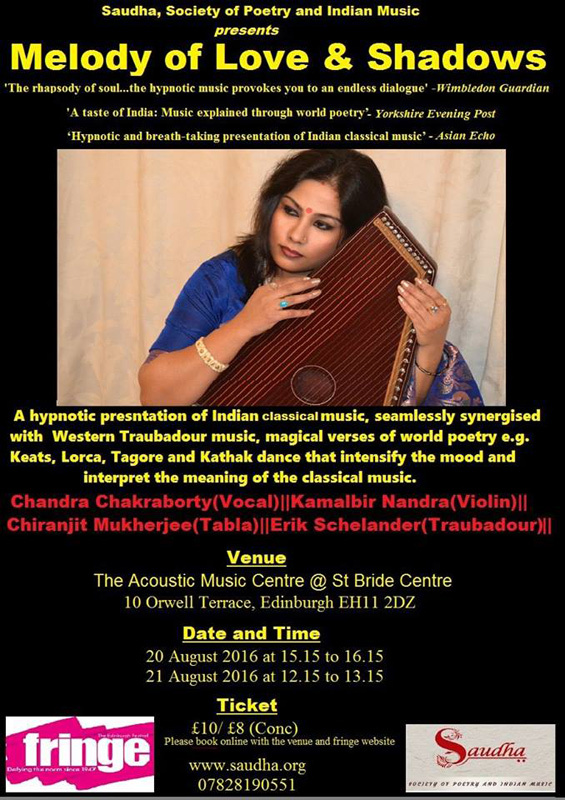 After having world premiere at Edinburgh Fringe this year and critically acclaimed by number of musicologists, prominent media, Saudha, Society of Poetry and Indian Music: 'one of the prominent Indian classical music promoters in the country' (BBC Radio), offers a hypnotic and 'breath-taking' presentation ('Rhapsody of Soul' -Guardian|| 'Seraphic ecstasy of Indian Raaga Music'- Yorkshire Reporter) of Indian classical music in this unique production. Performance will be lead by the leading classical vocalist Chandra Chakraborty (www.ChandraChakraborty.info), and accompanied by critically acclaimed, prominent accompanying artists like Pandit Sanju Sahai (http://www.sanjusahai.com/ ) on Tabla, Rekesh Chouhan (http://www.rekeshchauhan.com/ ) on Harmonium and Jaymini Sahai(Kathak). 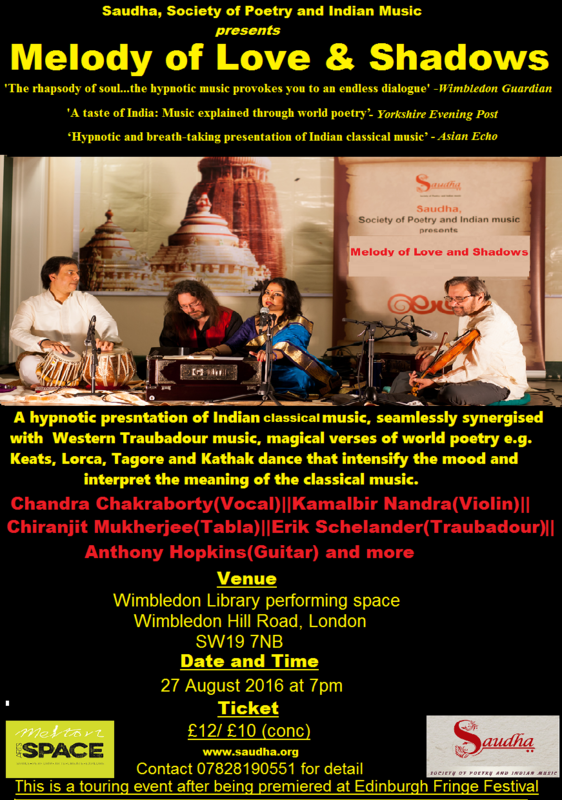 The Indian classical music is then, seamlessly mingled with French, medieval, romantic troubadour music and haunting verses of world poetry in English by actor and Schubert vocalist Erik Schelander, to interpret and intensify the profound mood of the transcendental music.